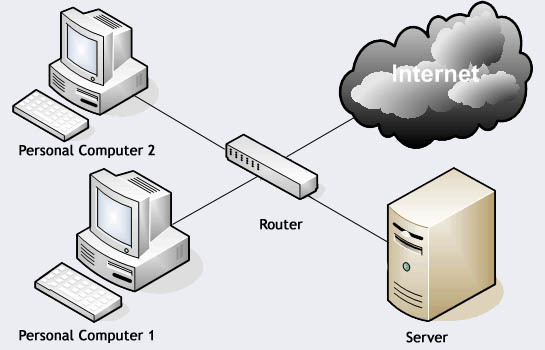 A local area network (LAN) is a group of computers within a small area, such as a house, office or school that are connected to each other. Most academic institutions and corporate networks use LANs. Now imagine that all computers in that group should have access to the Internet. Users should be able to open web sites, send emails or use some messengers like ICQ, MSN, Yahoo, Skype and others. The first solution for that purpose is to connect each computer separately to the Internet. It sounds simple but from the financial point of view it is very expansive (multiple contracts with Internet provider). Furthermore it will be also very difficult to secure such network. Instead of connecting all computers to the internet seperately is not it a good idea to connect to the internet one strong computer and then share the connection with others? Just imagine how simple it will be to monitor all users' online activities and prevent any hacker attacks from outside (Internet). That computer (the strongest one) will be something like a shield for others. The computer which will be used as gateway to the Internet is called Server. To prevent attacks from outside and monitor computers in LAN, IT guys use special software called firewall. It could be software installed on Operating System (OS) or preinstalled in router (special device which helps computers to communicate with each other). Firewall is designed to block unauthorized access while permitting authorized communications. It could be configured to permit, deny, encrypt, decrypt, or proxy all network communications between computers based upon a set of rules and other criteria. So every time when you are opening a web page the request is sent to the Server (the strongest computer). Later the request is tested upon set of rules and in case of success it will be forwarded to the Internet. Otherwise you will get access denied message. Firewall, it is exactly the point where your requests to open facebook, bebo, myspace and other websites are blocked.